(Nanowerk News) In an international first, scientists from the Institute of Quantum Optics and Quantum Information (IQOQI) produced a Bose-Einstein condensate of the alkaline-earth element strontium, thus narrowly winning an international competition between many first-rate scientific groups. Choosing the isotope 84Sr, which has received little attention so far, proved to be the right choice for the breakthrough. It can now be regarded as an ideal candidate for future experiments with atomic two-electron systems. This is not the first time that Prof. Rudolf Grimm and his scientific team have won a tightly contested race between scientists: in 2002, they were the first to produce a Bose-Einstein condensate of cesium atoms. Now junior scientist Dr. Florian Schreck and his team obtained the first Bose-Einstein condensate of strontium atoms, thus winning a tight international race despite having started their experiment much later than their competitors in the U.S.A.
"We backed the right horse and, towards the end, worked day and night to realize this Bose-Einstein condensate," says Dr. Schreck. For years physicists from all over the world have tried to condense atomic strontium, focusing mainly on the two strontium isotopes that are relatively abundant in nature (86Sr, 88Sr). But the breakthrough came when Dr. Schrecks' team decided to try a new, almost counterintuitive approach. "A year ago I had the idea to try it with the isotope 84Sr which has a low natural abundance," recounts Dr. Schreck concerning the moment of breakthrough. Never considered before because of its' low natural abundance, new theoretical calculations soon showed that this neglected isotope had an ideal scattering length for producing a Bose-Einstein Condensate as compared to the other, more abundant, isotopes. As an initial step, strontium atoms were collected in a magnetic trap and cooled using laser cooling and trapping techniques that were refined in IQOQI. In order to isolate these atoms from undesired interactions with the environment, the experiment was performed in an ultra-high vacuum chamber. After loading the atoms into an optical trap, they were cooled to near absolute zero (- 273.15 ºC) by evaporative cooling techniques made possible due to the excellent scattering properties of this particular isotope – the atoms collide and thermalize without being lost due to molecule formation. This was the crucial step that was not possible with the other strontium isotopes. 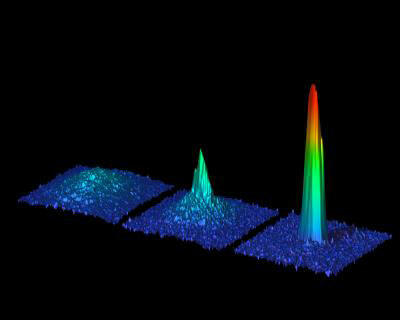 In this manner, a Bose-Einstein Condensate of 150,000 atoms was produced. This new form of matter is a purely quantum phenomena where the atoms lose their individual identities and coalesce into a single, collective state. The scientists of the Institute for Quantum Optics and Quantum Information (IQOQI) of the Austrian Academy of Sciences (ÖAW) have now succeeded in doing with strontium what other scientists have done with other chemical elements. Only two weeks after the success of the Innsbruck team, a research group from the U.S. also achieved Bose-Einstein condensation of strontium atoms. Both research results are now published in the same issue of the journal Physical Review Letters. Strontium belongs to the atomic two-electron systems; these are elements whose atoms have two valence electrons. Most of the atoms with one valence electron have already been successfully condensed (the Nobel Prize in Physics was awarded for this achievement in 2001), making Bose-Einstein condensation of two-electron systems a new hot topic in the field of physics. Although ytterbium (2003) and calcium (June 2009) were the first two-electron systems to be condensed, it is with strontium that significantly large Bose-Einstein Condensates have been produced. With Bose-Einstein condensates research in fundamental quantum mechanics can be carried out; these include developing new schemes for quantum computation, modeling condensed matter systems, and performing precision measurements of forces on the micrometer scale, which still pose many challenges to physicists today. "The opportunities we have at the Institute for Quantum Optics and Quantum Information (IQOQI) are a crucial factor in our success," underlines Rudolf Grimm. "We had a free hand in trying something totally new and, thus, were able to enter this international race." But Dr. Schreck and his team are not stopping there. They have already started working on a new exciting direction; besides the three bosonic isotopes of strontium mentioned above, there is a fermionic isotope, 87Sr, which Dr. Schreck intends to use to produce the first ultracold Fermi gas of strontium atoms.